TCD has been awarded with a 2009 E.T.S. Walton Visitor award from Science Foundation Ireland. Professor Thorri Gunnlaugsson has been awarded a 2009 Erskine Fellowship (www.canterbury.ac.nz/erskine/) from the University of Canterbury, New Zealand. This prestigious Fellowship will enable Thorri to visit the Department of Chemistry at the University of Canterbury for 7 weeks between September and October this year where he will give lectures to both undergraduate and postgraduate students as well as participating in local research meetings and symposia. His host at the University of Canterbury is Professor Paul Kruger, a former member of the School of Chemistry here at Trinity College Dublin. 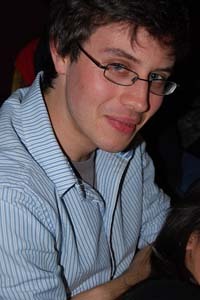 He will also present the work from his Research Group in TCD at University of Otago, New Zealand, as well as at Sydney and Deakin Universities in Australia; but at Deakin University he will take part in the inaugural meeting of SCiNZaA (Supramolecular Chemistry in New Zealand and Australia), which is organised by Dr. Fred Pfeffer, a former lecturer in the Department of Chemistry at TCD. TCD has been awarded with a 2009 E.T.S. 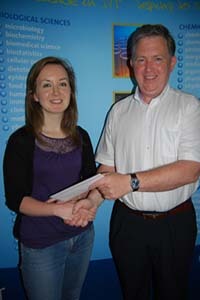 Walton Visitor award from Science Foundation Ireland. The grant is to enable highly qualified academic researchers from outside Ireland to work on their own research projects in collaboration with local scientists in Ireland. Professor Beate Röder from the Humboldt University Berlin will spend 4 months in Dublin working with Professors Mathias Senge, Werner Blau, Marek Radomski and Dermot Kelleher on the problem of Photodynamic Inactivation of antibiotic-resistent bacteria. The research develops collaborative projects in the group of Prof. Senge already funded by Science Foundation Ireland and the Health Research Board. The present award is the result of a longstanding collaboration between the groups of Prof. Senge and Roeder and will also focus on the devevlopment of new postgraduate courses in photomedicine and cancer treatment. Each year, past winners of the Nobel Prize meet on the picturesque German island of Lindau in order to discuss their research and various important global issues. Count Lennart Bernadotte, the 100th anniversary of whose birth is celebrated this year, co-initiated the Lindau meetings in an effort to promote science and to allow young researchers at the beginning of their careers the opportunity to interact with Nobel Laureates in their field of learning. This year’s meeting of 24 Nobel Laureates was dedicated to Chemistry, and I was fortunate to be among the 580 young researchers from 66 countries in attendance. The selection process in my case began with my recommendation by TCD to The Royal Society of Chemistry (RSC). 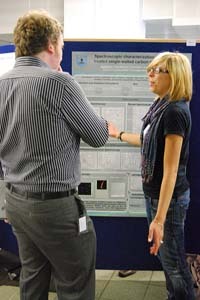 The RSC chose 10 candidates from UK and Irish universities of which 8 were accepted by the Lindau Committee in Germany. The meeting commenced on Sunday, 28th June and ended on Friday, 3rd July. Thanks to Ryanair the RSC group missed the opening ceremony and reception on Sunday, however it gave us an opportunity to get to relax as our first day started early and, being in Germany, each minute of every day was timetabled. Lectures began at 9.00 a.m. each day and the timetable was made up of fascinating lectures given by distinguished Nobel Laureates. These were followed by stimulating small group discussions with the Laureates. As ‘networking’ among researchers and with Laureates was highly encouraged by the Council, numerous “Bavarian get-togethers” were organised for the evenings, though our group’s plans for early nights were scuppered after the discovery of “Mike’s Irish pub”, which allowed us to “network” late into the night! 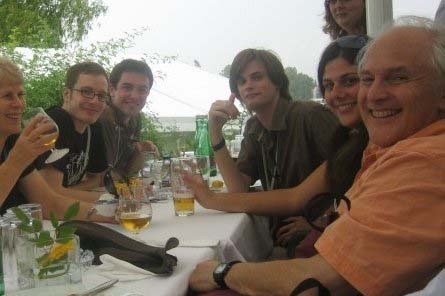 Particularly impressive was Prof. Dr. Sir Harold Kroto (Chemistry 1996). Kroto’s thought-provoking though humorous lecture on “Science, Society and Sustainability” was remarkable. He pointed out that his “useless molecule” had a very profound use: it gave him the voice to found a number of teaching/learning networks (such as Vega) around the world, bringing the excitement of science to young children from all walks of life through playgroups, often hosted by himself, and through the internet. We were fortunate enough to have lunch with him after his talk, though we soon found ourselves huddled under a parasol in a freak thunderstorm. We were also lucky to again be accompanied by him during the cruise to the Isle of Mainau where a panel discussion on climate change was held. I found myself briefly hired as his personal photographer while he was mobbed by hundreds of autograph hunters. The champagne we were served at 8 a.m did make up for this however, and also helped us to enjoy the “chemistry balloon artist”, Profs. Kroto and Grubbs were particularly willing to get involved as the photos show. We were also very impressed by Dr. Richard Ernst (Chemistry 1991) who delivered a most thought-inspiring lecture entitled “Passions and Activities beyond Science”. 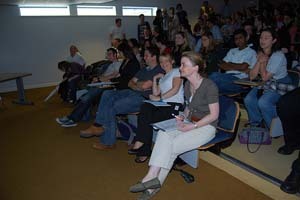 In this lecture he emphasised the need to have interests beyond Chemistry. He outlined his passion for ancient Tibetan art, which led him to his studies in Buddhism. He also outlined the process by which he restores ancient paintings - using a Raman spectrometer (which he keeps in his spare bedroom) to identify the constituent compounds used to make up each colour before he retouches them. The experience of Lindau has been one of the highlights of my Ph.D. studies so far. I was delighted to represent TCD/RSC at this meeting of eminent scientists who, for me, previously only existed in textbooks. Left to right: Margaret Kroto, Rob Thatcher (University of York), Gearóid Ó Máille (University of Dublin, Trinity College), Sean Thurston (University of East Anglia), Asimo Karnezis (University of Melbourne), Prof. Sir Harold Kroto. The 10th Annual Symposium in Supramolecular Chemistry in Ireland was held at Trinity College on Thursday the 9th of July. 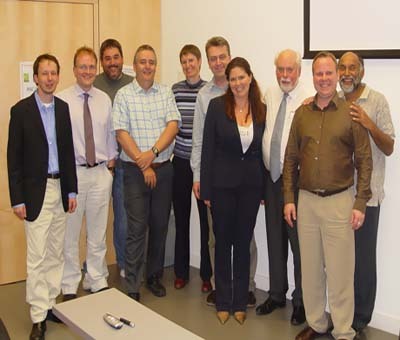 This event, which has been an important event in the School of Chemistry calendar year since the first symposium in 2000, was hosted by Professor Thorfinnur Gunnlaugsson and Dr Silvia Giordani, with the assistance of their respective research groups. Over 140 delegates from Ireland and several other European countries attended this year's symposium, which was held in honour of Professor Sir Fraser Stoddart, who also received an Honorary Doctor of Science degree from Trinity College on Friday the 10th of July. 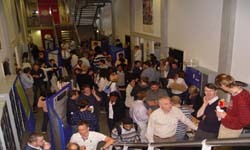 As in previous years, the meeting was extraordinarily successful, with presentations from eight leading scientists, and thirty poster presentations given by PhD students and postdoctoral fellows as well as young academics. 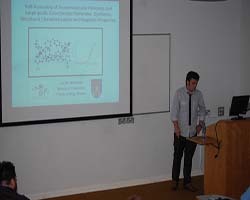 This year’s symposium was held under the auspices of the Local Committee of the Royal Society of Chemistry (RSC), and was also sponsored by several other Irish organizations such as The Irish Council for Research and Engineering (IRCSET), The Center for Synthesis and Chemical Biology (CSCB), Centre for Research on Adaptive Nanostructures and Nanodevices (CRANN) and Science Foundation Ireland (SFI). This year’s programme demonstrated the versatility of the field of supramolecular chemistry. The programme included a presentation given by Professor A. P de Silva, from Queen’s University Belfast, who gave an invigorating lecture on the development of molecular sensors and logic devices, entitled “2009: A small space odyssey with luminescent molecules”. Professor de Silva showed that single molecules can function as a “molecular spy” to detect the whereabouts and determine the concentrations of specific analytes, such as those monitored in critical care analysis. Professor Douglas Philp, from the University of St Andrews, Scotland, whose presentation entitled “Selecting one reagent from a mixture: Exploiting replication networks in dynamic covalent chemistry“, described some of his pioneering discoveries in the development of self-catalytic and self-replicating molecules, where self-assembling molecules in solution form templates that function as catalysts for their own synthesis, which can be considered as an example of self-selection. Dr Tony James, from the University of Bath, England, demonstrated in his presentation “Molecular recognition using boronic acids” the power of employing boronic acid as a receptors for diols, and that this simple chemistry can be used to create novel luminescent and naked-eye detection methods for monitoring sugars, such as glucoses or even glycoproteins in humans and animals, and that this application is at a very advanced development stage. 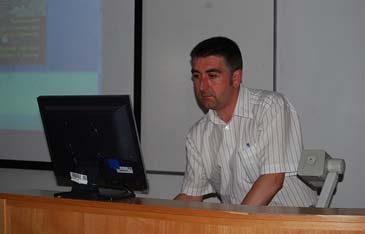 Professor Donal O’Shea, from University College Dublin, showed in his presentation entitled "Combining therapeutic treatments with fluorescence imaging a theranostic approach", groundbreaking research where a single molecule can function as a drug and an imaging agent for cancer tumours, or bacteria, such as MRSI. Furthermore, he showed that these molecules, in conjunction with non-invasive and low energy light, can potentially be used in the treatments for those suffering from such illnesses. Within the area of inorganic supramolecular chemistry, Professor Sally Brooker, from the University of Otago, New Zealand, showed in her presentation, entitled “Spin crossover and anion-π interactions in iron(II) triazole complexes", that the magnetism of novel metal and poly-metal coordination complexes can be controlled externally by design, which allows for their potential use in future data storage, where information can be written and read on a molecular level. Using X-ray crystallography, she showed that such complexes can form complexed array networks with a real potential application. 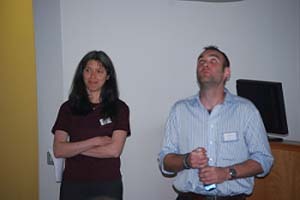 This year’s symposium also featured the work of two young academic members of the School of Chemistry at Trinity College, Dr Wolfgang Schmitt and Dr Silvia Giordani. In his presentation, entitled “Self-assembly of functionalized oxo-clusters, Supramolecular helicates and amphiphilic coordination networks“, Dr Wolfgang Schmitt presented an astonishing amount of work within the area of inorganic materials science, where large clusters and molecular capsules can be formed using metal-directed synthesis by employing elegantly designed organic ligands. The presentation also demonstrated the potential application of these materials in novel nanochemistry as well as in medicinal chemistry. Dr Silvia Giordani, who is an SFI PIYRA awardee, showed in her presentation, entitled “Spiropyrans and single walled carbon nanotubes” a vast amount of research in the area of nanochemistry and nanotechnology, where molecular switches activated by light, can be incorporated onto materials such as carbon nanotubes and employed as molecular-level devices and as potential delivery vehicles. These are highly novel areas of research with significant value to both applied nanotechnology and medicinal chemistry. The symposium concluded with a plenary lecture from Professor Sir Fraser Stoddart, entitled “Mechanostereochemistry”, a title “that encompasses all aspects of the mechanical bond in chemistry”. 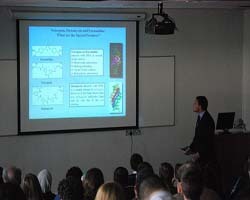 In his inspiring lecture, Sir Fraser engaged the audience in a unique endeavour, which took them from advanced supramolecular chemistry, where various interlocked molecules were synthesized using supramolecular approaches and molecular organic frameworks (MOFs), designed to have a predefined function, to detailed analyses of their properties, using various state-of-the-art techniques. The presentation by Sir Fraser clearly demonstrated how the field of supramolecular chemistry has grown rapidly in the last a few years, where the emphasis on developing novel functional materials and devices has been at the heart of its expansion. Sir Fraser further described this development as the merger of a new area of chemistry, which could be best described as Mechanostereochemistry, or the chemistry of systems beyond the classical description of a supermolecule, relating to robust mechanically interlocked components of precise form and function. Sir Fraser demonstrated that he is an extraordinary lecturer that captivated the audience throughout his presentation with cutting edge research. Summer Student Jayce Cheng wins prize for best poster at the SURE poster competition. Summer Student Jayce Cheng wins prize for best poster at the SURE poster competition. Jayce Cheng, an undergraduate student at the University of Illinois Urbana-Champaign in the United States (UIUC), joined the group of Dr. Paula Colavita at the School of Chemistry during the summer months under the sponsorship of the SURE programme (Summer Undergraduate Research Experience). Jayce, who originally comes from Singapore, is a bright fourth year student at UIUC where he is finishing his Chemical Engineering degree. He worked for 10 weeks together with postgraduate student Ronan Cullen on a project aimed at understanding the surface chemistry of amorphous carbons. His results were presented at the SURE poster competition on September 2, where he was awarded first prize for his presentation. Congratulations Jayce!!! Rob Elmes, a second year postgraduate student working with Thorfinnur Gunnlaugsson in the School of Chemistry has been awarded the Nature Chemistry Prize for best supramolecular chemistry poster at Chirality and Supramolecular Chemical Synthesis 2009 which was held in Birmingham University this July. This conference allows presentation of exciting developments within the field of supramolecular chemistry to an international audience of top academics. The poster entitled ‘The Design, Synthesis and Photophysical Evaluation of a Novel Ruthenium(II)Polypyridyl Complex as a Potential Fluorescent DNA Probe’ was hand-picked by Nature Chemistry editor-in-chief Stuart Cantrill during the 2-day symposium. TCD has been awarded with a 2009 E.T.S. The grant is to enable highly qualified academic researchers from outside Ireland to work on their own research projects in collaboration with local scientists in Ireland. Professor Beate Röder from the Humboldt University Berlin will spend 4 months in Dublin working with Professors Mathias Senge, Werner Blau, Marek Radomski and Dermot Kelleher on the problem of Photodynamic Inactivation of antibiotic-resistent bacteria. The research develops collaborative projects in the group of Prof. Senge already funded by Science Foundation Ireland and the Health Research Board. The present award is the result of a longstanding collaboration between the groups of Prof. Senge and Roeder and will also focus on the devevlopment of new postgraduate courses in photomedicine and cancer treatment. 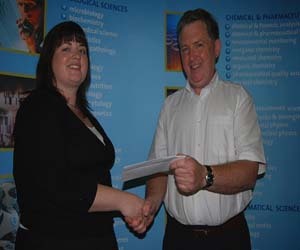 Gemma Keegan (left picture) and Deanne Nolan (right picture) being awarded their prizes by Dr. Liam Tully, Team Leader, Pfizer Global Process Development Centre in Cork. 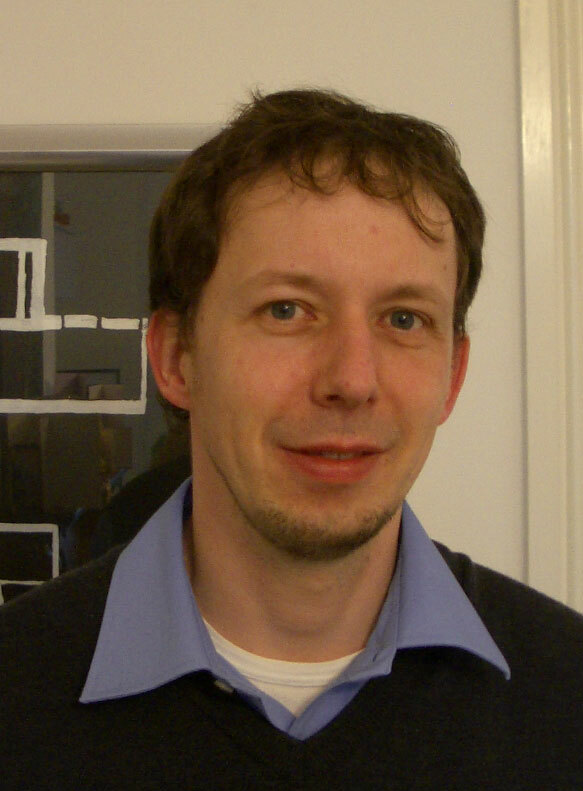 Wolfgang Schmitt is currently a Lecturer in Inorganic and Materials Chemistry. Dr Schmitt studied Chemistry at the Technical University Darmstadt, Germany and graduated as Dipl. Ing. (Chemistry) in 1999. He was awarded the Dr Anton Keller Prize from the University of Darmstadt and received his Ph.D. from the University of Karlsruhe in 2002. From 2002-2003 he worked as a postdoctoral fellow at the Royal Institution of Great Britain. In March 2003 he was selected to join the International Centre for Young Scientists at the National Institute for Materials Sciences in Tsukuba, Japan as an independent research fellow. 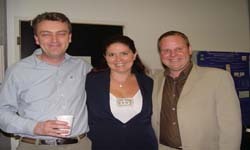 Dr Schmitt joined the School of Chemistry in October 2005. His research interests focus on the supramolecular chemistry of hybrid organic-inorganic materials aiming to exploit these advanced materials for sustainable energy applications, catalysis and molecular magnetic devices. On Thursday April 2nd an audience of SF (TR071) Chemistry students and a prestigious judging panel met to determine the winning presentation in a Chemistry team competition. This event was the culmination of several months of research by the students on topics that demonstrate the societal importance of Chemistry. Those present learnt how chemical processes in our brains, hearts and bodies are responsible for their healthy function and how these can be influenced by external factors such as disease and alcohol. The winning team gave an entertaining and imaginative talk on The Chemistry of A Nuclear Meltdown, using an RTE news flash as the backdrop to a fictitious nuclear disaster in Northern England. The medals and perpetual silver trophy were presented to Fergus Poynton, Barbara Cusack and other group members, by Dr. Seamus Grant (Managing Director of Henkel and generous sponsor of the exercise which was first introduced in the School in 2000). 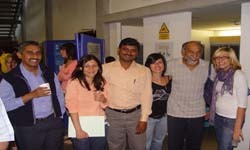 The enthusiasm of the students and the quality of the presentations led to a truly memorable event. The School would like to thank Claire Mulhall (Manager of the RDS Foundation), Clive Williams (Dean of FEMS) and Mike Lyons (School DUTL) for their participation on the judging panel and to congratulate Paula Colavita (staff member associated with the winning team) and Colin Martin (teaching fellow) for a successful evening. The Chemical hangman held during the interval now has a cumulative annual score of Draper 0 students 2. 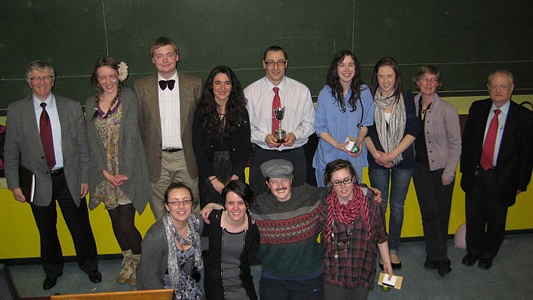 Members of the winning team, along with the judging panel at the SF BC Presentation Final 2009. The BOC Gases Bursary is awarded annually to a postgraduate student who has completed one year of research studies in the School of Chemistry and who has made significant advances in their research. This year’s winner is Mr David Scanlon from Sherlockstown, Sallins, Co. Kildare. David graduated in 2006 with a B.A. Mod in Computational Chemistry. He is working with Prof. Graeme W. Watson, using state of the art computer modelling techniques to investigate defective oxide systems with environmental applications as wide ranging as catalysis, Li battery materials, and solar panel materials. David is just over halfway through his PhD studies and would like to continue on in academic research, especially in the field of predictive chemical design of materials for next generation renewable energy technologies. 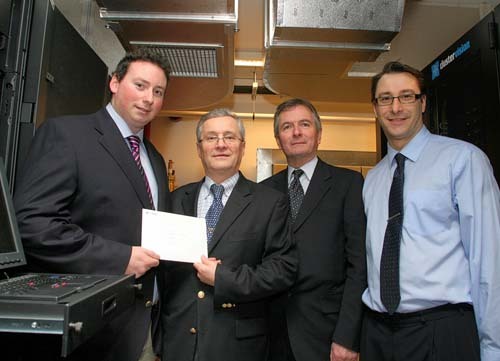 From Left to right Mr David Scanlon (Award Winner 08-09), Mr Gerry Donovan (Managing Director of BOC Gases), Prof. David Grayson (Head, School of Chemistry), Prof. Graeme Watson (Research Supervisor). Previous winners of the BOC Gases Bursary were, Mr Giuseppe La Spina (2007-08), Ms Barbara Procuranti (2006-07), Dr Aron Walsh (2005-06), Dr Niamh Kelly and Dr Ciarán Ó’Dálaigh (2004-05), Dr Andrew Harte (2003-04), Dr Áine Whelan (2002-03), Dr Mark Glynn (2001-02), Dr Yvonne Kavanagh (2000-01), Dr Daniel Gregg (1999-00), Dr Judith Murphy and Dr Noelle Scully (1998-99), Dr Conor Crean (1997-98).